On Wednesday, June 7th, approximately 150 individuals gathered at Queen’s Park in New Westminster to raise awareness for ABI. This event was run by the Strive Centre Vancouver and Strive Centre Headway Ne w West, offering an inclusive venue for participants, caregivers, and members of the community. Food was offered, along with games, swag, dancing, and live music by DJ James. James also gave a fantastic speech and told his story of recovery. Below is his speech. Hi. Most of you know me as DJ James but today my name is just James. I suffered my stroke in August of 2010. This event has changed MY life in a major way with all but the entire loss of my speech, the loss of certain mobility, and I could say only two words. After two days in hospital, I started having severe seizures up to 17 times per day. I was moved to the critical care unit (CCU), so my seizures could be controlled first. Then I came back to the second floor and started my speech-language therapy and physiotherapy. Here, I re-learned how to say my name “James” again. I was so happy! I then continued to learn more single words, but I could not put a sentence together. When I was discharged from hospital, I was given a book called “Let’s Talk about Stroke”, which is funny because “I couldn’t talk!” I was given no support… no Social Worker, no speech therapy, no physiotherapy, and no occupational therapy. It took 6 months and the help of my good friend John to get me the help I needed because of my Brain Injury; I was required to do a lot of paper work – which I couldn’t do because of Aphasia. I finally started speech therapy through the Acquired Brain Injury Program. During this time, I worked on improving my memory for words, putting words into sentences, and improving my texting. You don’t understand the respect I have for text. Texting was my only way of getting the words out that I could NOT say or write, texting was my tool to express what I needed, even if I was sitting next to the person I was trying to say it to. Texting was and still is so important to me. It’s been 6 years and I am very fortunate to have had the Stroke Recovery of B.C., Columbia Speech & Language, and Headway New West helping me. I am getting some of my life back through sheer da ter ma nation and by taking therapy for my Expressive Aphasia. I know my speech is getting better, but I still need help to improve some more. 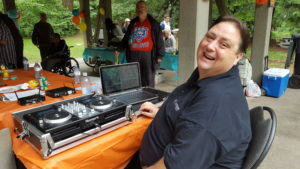 In my “former” life, I was a Professional DJ, and I’m working hard on gradually getting back to that life by doing the music for some Brain Injury events like B.L.A.S.T Camp, Sea-to-Sky Aphasia Camp, Headway, and Semiahmoo House Society. I have spoken to students in the UBC program to help them understand Aphasia and Aphasia Recovery. I share my experiences with people I meet including bus drivers or Facebook, and with as many people as I can talk to. I participated in a video for the Stroke Recovery Association of BC to help raise awareness about language and communication recovery after strokes. For the last year and a half I have lived independently in my own Apartment with the Langley Timbers Apartment Program through Cheshire Homes Society. I volunteer at the Salvation Army Thrift Store Aldergrove and do clothes tags and much more. There was a worker from Headway (Megan) who helped me re-learn how to be a DJ. Headway helped me re-learn how to cook and much more. I also get the opportunity to socialize with all you great people. 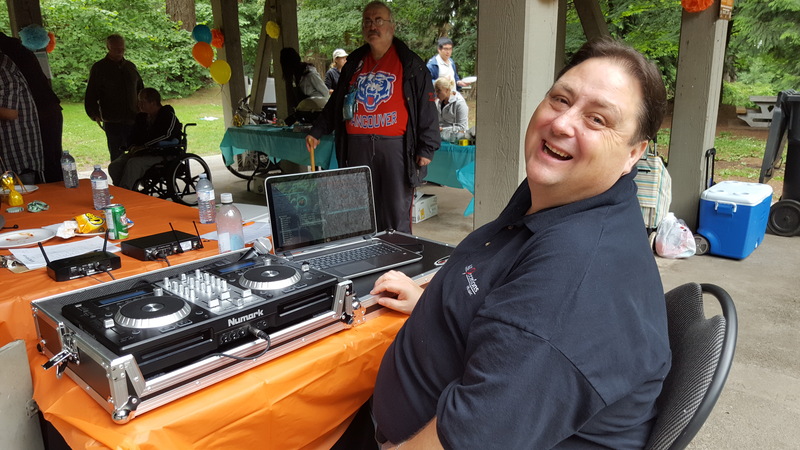 I have received so much help from STRIVE LIVING SOCIETY with Care Workers and Headway New West since my Acquired Brain Injury, so I want to give back through volunteering as a DJ and try to help in any way that I can. I wouldn’t have come so far without STRIVE LIVING SOCIETY and today I have the honour to speak to all of you. From the bottom of my Heart I want to THANK all Strive Workers and friends. Ladies and Gentlemen thank-you for letting me talk about my Brain Injury and now it’s time to go back to being DJ James. Thank you for sharing your inspiring story, James! It means a lot to us.